The use of unmanned aerial vehicles (UAVs) or drones is increasing in the commercial as well as academic areas. Governmental agencies and companies find them progressively more useful to assist their businesses, and researchers are continually seeking new and unique applications for the devices. But that progress involves a technology that is still new and constantly evolving. From large and small models of fixed-wing drones to quad-copters, the mechanics and usefulness of UAV technology are still in the preliminary stages of being understood. In order to improve their operational capabilities, the UAVs has to be controllable in all types of environmental conditions, particularly conditions such as in severe weather or unsure environments that a majority of aerodynamic vehicles actively avoid, although they will unpredictably come across a number of different environments. The presence of a large number of disturbances and uncertainty could disturb the function of the conventional controllers and lead to major degradation of performance, resulting in instability and even damages. That is where Beibei Ren, an assistant professor in the Department of Mechanical Engineering at Texas Tech University, and her research team are focusing their efforts - developing on-board intelligence into the flight control system to hold unknown perturbations and enable adaptation to severe flight conditions. We want to push the boundaries of the control theory to maximize the impact of control for different systems. For UAVs, we are particularly interested in developing advanced control strategies that will allow the deployment of the UAVs under extreme and uncertain environmental conditions to accomplish complex tasks. Such challenging conditions spans everything from flying the drone very close to a wind turbine to measure the turbine’s health to landing drones on ships, where it is definitely not a smooth process with sea and wind currents as well as the motions of the ship. Lately, Ren and her collaborators have created a novel uncertainty and disturbance estimator (UDE)-based robust control for UAVs to improve their operational capabilities in harsh environments. The basic idea of UDE-based robust control is to rapidly predict and compensate for disturbances and uncertainties, which greatly improves system robustness and stability. The first round of results in both simulation and experimental studies has revealed that the UDE-based robust control is easy to execute while offering better performance compared to current robust control techniques. What we are developing are drones with everything on board. We’re developing drones with the control intelligence system on board, which means the drone is ready to fly anywhere, anytime and can do different tasks. Suppose you have a different model, a different system and your control system algorithm needs to be changed. Sometimes you have differences that make the system parameters or properties different, so you have to design a vast control system to fly on those platforms safely and accurately. That is what we are working on from a research perspective. Infrastructure health monitoring is one probable application where UAVs can be applied, Ren said. That could involve responsibilities such as gas and oil pipeline monitoring, monitoring the structural integrity of roads and bridges or mobile highway traffic monitoring and coordination. Drones used to monitor wind turbines, especially on the large wind farms of the South Plains in West Texas. So instead of using one person to monitor the health of wind turbines, many drones could accomplish the task much more efficiently. However, there are problems with flying drones very close to the turbines, which can cost over $2 million. The most urgent of those problems involves proximity. The accuracy of GPS technology – or how close a UAV can fly to a turbine, is about 2-5 m.
But that is not close enough to record accurate readings using instrumentation to establish the integrity of the turbine blades. So Ren’s team is involved in developing control systems that would enable the UAV to fly closer to the wind turbine, taking into consideration the wind currents produced by the huge blades as well as other factors. That accuracy, Ren said, relies on the controllers and sensors on board the drone, and that is the focal point of Ren’s research team, creating the on-board intelligence that allows drones to adjust to all possible variables linked with a specific region or place. Another probable application of drones is for marine search and rescue. However, landing a drone on a ship at sea can also be quite a challenge. Shipboard landing would require precise relative navigation and ability to maneuver in extremely turbulent ship air wakes and landing on rolling and pitching decks at high seas. 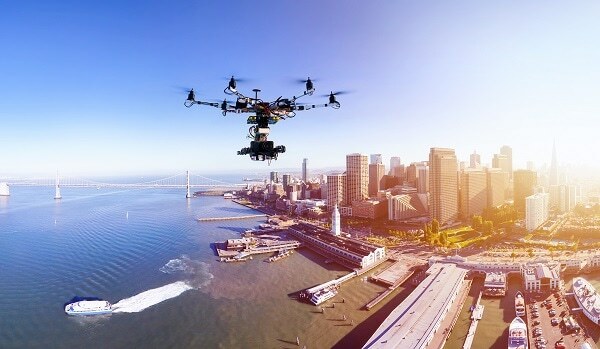 Furthermore, at sea, wind gusts may impact the operation of the drone, and in the middle of the ocean, visual acuity from cameras or GPS technology will not always be available. It is almost like flying blind. “Those challenges are related to what we have been working on,” Ren said. Establishing if the control systems are an improvement, however, depends on the understanding of data collected when they are tested. Establishing data’s accuracy and usefulness requires experts from multiple fields of study. What Ren and her fellow researchers can establish is if the drone’s control system operated efficiently to allow for that data to be gathered in the most ideal possible way. They also can use old data to enhance the drone’s stability and optimize its trajectory. Accuracy depends on the sensors, and that control scheme is what our experience is in. That’s called on-board intelligence. We can work with those experts to do real-time work interactions and collaborations. But our goal is to improve the flight and stability and to provide data collection as well. Battery life could be one improvement to drones but it is remains to be solved. Until now, the average flight time for drones such as the quad-copter variety Ren uses is approximately 10-30 minutes. If it transports more sensor equipment, that additional weight will deplete the batteries a lot quicker. Though there has been plenty of research on drones, batteries are still restrictive. A solar–powered drone is a potential idea, but Ren said the conversion rate of the solar panels is not that promising, resulting in ineffectiveness. The solution could not lie in the battery itself but in implementing wireless charging stations. Wireless charging could be performed even if the drone is flying, landing, or hovering on a charging station, Ren said. Also, having a number of charging stations in a specific area would allow drones to not only recharge swiftly but promote their use, which could be especially helpful in areas such as infrastructure health monitoring. “We need to improve the efficiency and positioning so you have the most effective system possible,” Ren said.